Children, parents and teachers of Communities In Schools at the 2nd Annual Galena Park Christmas Parade. Galena Park, TX. – Saturday, December 9, 2017 — Galena Park Mayor Esmeralda Moya partnered with the Committee for a Better Galena Park to give the community its 2nd annual Christmas Parade. The parade led by a police car with sirens blaring began on Clinton Drive as it worked its way through the heart of the city on Main Street. The parade ended at the city’s basketball pavilion in the park, food and refreshments were available along with arts and crafts vendors. The city’s float, “CANDY LAND,” was decorated with gingerbread men, peppermint candy canes and lollipops. The American Legion Post 499 had a float with patriotic flags of the Armed Forces. Judging the floats was Dorothie Harding, John Huff and Gina Gheller. 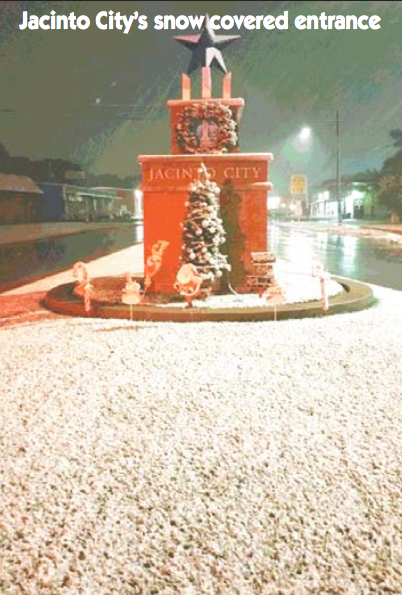 Thursday, December 7, 2017 – Jacinto City, Tx. – Each holiday season State Representative Ana Hernandez of House District 143 invites her constituents to an open house at the district office. The joyous and cheerful event provides festive food and refreshments for her guests. Hernandez also uses this opportunity to visit and to learn of any issues or concerns anyone may have in which she can be of help. Each month Hernandez and her staff visits civic and neighborhood clubs keeping members informed on important issues and to provide help with issues they may have. Thursday, December 7, 2017 — If you were up late you may have been one of the thousands of Houstonians seeing the first bits of snowflakes falling. I was one of those up late because my wife Linda was baking cookies and Baklava (a Lebanese pastry) for the holiday party the next day. It was a little before midnight when I glanced at the security camera monitor and saw the first snowflakes fall.